If there’s one thing that remains consistent about the differences between iOS and Android users, it’s that the former seem to install, engage with and pay for more mobile applications. 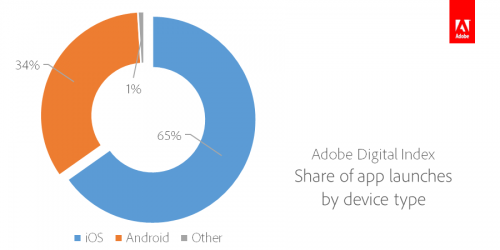 Today, a new study from Adobe Digital Index reinforces a few of these points using new data collected from over 700 million apps sessions, noting that iOS now represents 65% of app launches to Android’s 34%, and that the average iOS app is used twice as long as the average Android app. That being said, Android app usage growth tops that of iOS by two times, at 80% versus 40%, respectively, year-over-year. That could indicate that at some point in the future, we’ll see Android app usage patterns catching up a bit to those on iOS. That this behavior occurs is not exactly new information. For years, we’ve heard that iOS dominates Android in terms of usage, including both app and overall smartphone usage. 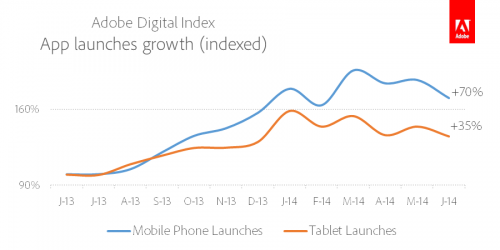 That iOS dominates in mobile web browsing, and the iOS App Store makes developers more money. And all this despite Android having the largest global market share. What the reports generally fail to offer is any sort of explanation. To some extent, it could be that early iPhone users were less price-sensitive from the very beginning, willing to pay for a premium hardware device and then willing to buy apps to fill it. They then use these apps, having some appreciation for the value of the creations that they may have spent some money to acquire. While both iOS and Android are now used by mainstream consumers, Android offers a range of devices that extend from high-quality hardware into low-end phones that are sometimes barely an upgrade from feature phones. These low-end devices may be in the hands of those who aren’t as interested in the app ecosystem, and merely needed the cheapest phone upgrade available from their carrier. These users also, understandably, would be careful about spending unnecessarily on paid apps, in-app purchases, and even on data usage itself. The new study also looked at more than 18 billion visits to over 10,000 U.S. websites and apps, and included several findings about shopping from smartphones and tablets, too. On smartphones, 23% of purchases were made with alternative payment methods like Google Wallet, PayPal, Amazon Payments or Apple Pay, while only 16% pay using digital wallets on desktops, and only 19% do the same on tablets. In addition, cart completion rates increase by 10% when digital wallet payment options are available.